And what for my eyes? That's the debate we are currently having. If you remember our engagement pictures, both FI and I have glasses on. When we first started dating, we both wore contacts. As we got more comfortable with each other, and more lazy, we started wearing our glasses more. When I started my first full-time job, it required getting up pretty early, and I decided that I would rather have a few extra minutes of sleep and wear my glasses than get up a little earlier to let my eyes wake up before putting in contacts. This turned into wearing glasses full-time, and I have done this for the last three and a half years, and so has FI. Now, both of our prescriptions have changed and neither of us have contacts that would work for us, so we are trying to decide whether or not to gradually get ourselves back into wearing contacts or just to stick with glasses. Honestly, I'm not all that happy with the way my face looks right now with the weight I have gained over the last few years, so I'm not sure I would want to wear contacts, but I'm also not sure I want to wear glasses. It kind of seems like I would be hiding behind them. But, then again, everyone has known me with glasses full-time for the last three and a half years. So would changing from glasses to contacts by kind of "not me?" What are your thoughts? Have you been in this position, deciding between glasses and contacts for the big day? What are the pros and cons you have weighed? Help, please! Working in technology and having designed many websites before, I knew that I wanted this to be special and as near to perfect as possible. I knew about all the free wedding websites that are offered out there, but I wanted something more unique, and more importantly, I wanted to be able to customize a lot of different elements. So, I decided to create my own. Although I know how to create websites from scratch, and have done that before, I figured that I would use something that I am familiar with, and not try to make it too complex, so I decided to use Blogger. While I did use a free template offered by Blogger, I made a lot of different changes to it, adding my own images and text, and changing the layout, and made it my own. I also took advantage of the deal offered, and purchased a custom domain name for only $10. 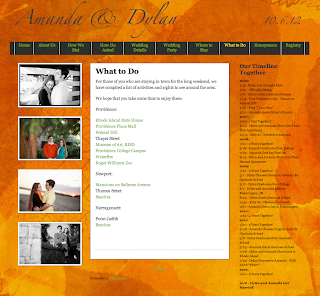 It took me a few months to get the site to be the way that I wanted it to look, but we finished it up this past week, just in time for the Save the Dates to go out. Here are a few screenshots of the site. I hope you enjoy! 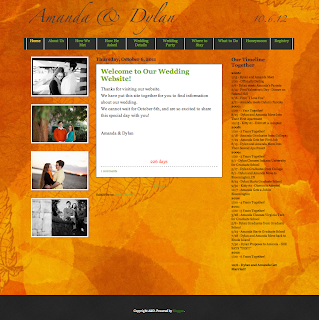 Did you create your own wedding website, hire out, or use one of the templates offered by so many of the wedding idea websites out there? I don't wear heels. You must understand that from the start. I own two pairs, they are both black, and one is a sandal, the other is a pump. They are max two inches tall each. That's about as high as I can go, and they both have chunky heels. I fractured my ankle and pulled a bunch of stuff in it my freshman year of college, and while my ankle is stronger now after physical therapy, it's still not the same. But more so, heels just aren't my thing. I like to be comfortable, they just aren't to me. So, I typically wear either flats or sneakers. A few years ago, I was looking for a pair of white flats. I went to Payless and found a really cute pair by the American Eagle brand for Payless, so I bought them. I wore them almost every day that spring and summer, and they got pretty torn up. So, when I found them still listed on the Payless site, I ordered three more pairs. I decided that I would wear down the two extra pairs, and that I would keep the other pair in its original packaging and wear for the wedding. I knew that they were comfortable, and they were cute. After reading countless wedding blogs, I noticed the trend of wearing colored shoes under your wedding dress. I absolutely loved this idea, but I had to make sure that the shoes were going to be comfortable, and shoes that I would wear again. About a year later, I came across a blog post with an adorable pair of yellow shoes with teal soles. I contacted the blogger, and she found out who made them: Gavrielli. I found the website for the shoes, immediately fell in love, and since they were a new designer, they were having a promo. 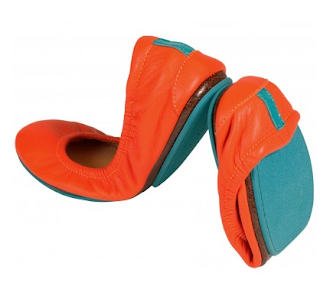 So, I contacted the company and ordered a pair in yellow, as pictured above, and a pair in orange - my favorite color. They shipped that afternoon, and I received them in the mail two days later. I opened the box to find the most beautiful packaging! It was absolutely gorgeous, and tucked inside was a handwritten note from the owner with her personal email address to contact her in case there were any issues. And, I did just that - I contacted her. Primarily to tell her how gorgeous both the packaging and the shoes were, but also to help with an exchange, as the shoes were just a tad bit too small. She said she would send out the new pair right away, and I could keep the too small ones to make sure that the new ones fit better and I didn't want to revert, and then told me to mail back the ones I didn't want after, using the prepaid return address label. I'm telling you, the customer service was incredible! And I'm not being paid or compensated to write this. It really was this good. So, I love this shoes so much, and I cannot recommend them more. Therefore, I have decided that I will be wearing the orange ones under my dress on the day of the wedding. They are comfortable, cute, and stylish, and I cannot wait to have that peek of color under my white dress. PS - Since then, I have also ordered both the Clover Green and Navy Tieks, and when the weather is nice out, I wear them to work. I cannot wait for it to get nice out, as I have tons of outfits planned with these colorful accessories. Now I just have to keep the orange ones in tip-top shape for the wedding. That may be hard considering I want to wear them every day!